Want an improved listening experience with your SONNET? Check out Adam’s review of the Roger™ 21 from Phonak, a brand new product that can be used with our SONNET audio processor. Adam, who is an adult cochlear implant recipient, tested out both the Roger 21 and the Roger™ Pen wireless microphone. Here he shares his review of the products. The Roger 21 is very comfortable to wear. I was quite surprised how light it was, and it actually seems lighter than other wireless receivers I have tried. When testing this product out, I wore the Roger 21 all day from 8am to 11pm, as well as trying it out in specific hearing situations. I had no problems with it whatsoever and it was easy to use. In the future, I would just wear the Roger 21 all the time to save me switching back and forth with the battery pack cover. The Roger 21 is identical in appearance to the standard battery cover and so it’s not a noticeable size change when you have it plugged in. It is slightly longer than the standard battery pack, but barely enough to be able to tell just by looking at it. The look of the Roger Pen is very sleek and discreet. Most people actually had no clue I was carrying something other than a pen or a magic marker! I wasn’t a fan of the lanyard as the pen bounced and moved too much, so I wore the Roger Pen in my shirt pocket. However, if you choose to wear it in your front pocket like I did, then you should be careful when bending over as it can easily slide out. Carrying the Roger Pen with me all day was not a problem at all. Since it is so small, this made transporting the device totally hassle-free! The first time figuring out how to connect the devices wirelessly was challenging for me, however after the first time it was really easy. As long as you hold the Roger Pen very close to the Roger 21 control unit during the pairing step, it is very easy to connect. I think it would help the usability if the writing on the buttons was clearer or darker. For the most part, the Roger Pen is quite easy to use. I used the pen in various ways that it is intended for, and I improvised figuring out how it works for other situations. For example, at home I do not have cable television and instead use an internet streaming box plugged into the back. Because of this, I was not able to use the Roger Pen cables to hook it up directly to the television. Instead, I placed the Roger Pen flat below the speaker on the television, enabling it to pick up the sound from the television speaker quite nicely. My wife wore the Roger Pen with the lanyard in a few different environments and it worked quite nicely to enable me to hear her voice clearly. I like the magnet that is used to put the lanyard around the neck as it makes it easier to put it on and take it off. The indicator lights on the Roger Pen are easy to see. It’s important to read the user manual to know what each button does on the device. I found the Roger Pen very easy to connect to a multimedia phone or iPad using the USB cable. I found the audio quality outstanding no matter how I used it, even if I was in rooms with high ceilings, low ceilings, or spaces with lots of metal or people. I was impressed that the audio quality was clear with the Roger Pen, even through floors or walls. I could hear my wife when she was upstairs in our bedroom. I also tested it inside a building while my son wore the lanyard outside the building with the door closed. My work often requires telephone conversations and in-person discussions. The Roger Pen made communicating with colleagues and phone calls much clearer as there was no interference. The Roger Pen also worked really well when I was driving in the car with the radio on and talking to my wife. I also tried turning the pen to face her directly, and the music and road noise dropped significantly, making our conversation even easier to understand. Watching a video on my tablet and listening on the phone with the Roger Pen gave excellent sound quality, and was quite easy to set up. There was zero feedback—the sound was almost hi-definition! I used the Roger Pen non-stop to get a good feel for its battery life. This included talking on the phone, watching multimedia, being out and about around town, and going out to eat with friends. I found that the battery life of the pen was around 10-12 hours. Charging the pen is quite easy. Honestly, I was surprised how quickly it went from completely dead to fully charged. 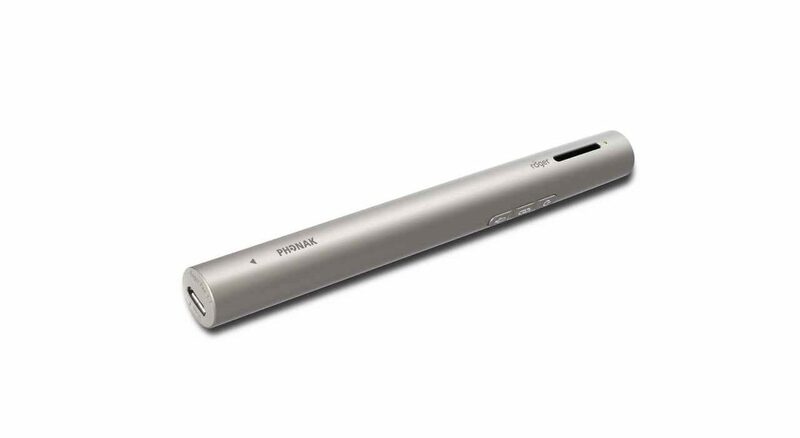 The pen has so many various uses that I think it would benefit any cochlear implant user. For me, the best thing about the Roger Pen is that it can really give speech a great deal of clarity, even in some of the most challenging listening environments. It gave me more freedom to sit where I wanted to, for example in a restaurant. I was able to take the speech understanding up a notch, an improvement from listening solely with my audio processor. MED-EL audio processors offer great hearing anyway in challenging environments, but sometimes a little boost can help. I think the main benefit of the Roger Pen for users is the assurance that the chances are reduced of missing something said to you. This really helped my self-confidence. Overall, whether it is work or play, I feel that Roger gives you that little extra hearing boost when needed. Get all of your questions about Roger 21 answered here! Or, find out all about Adam’s hearing journey here.